Techies Sphere: What is Group Policy Loopback Processing in Active Directory? What is Group Policy Loopback Processing in Active Directory? 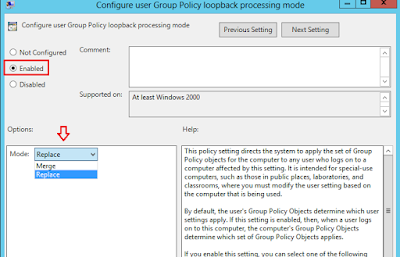 Or, How to enable Group Policy Loopback Processing for a Group Policy Object? Or, In what situation, you should think of using Group Policy Loopback Processing? Guys, Group Policy Loopback Processing is one of the cool feature of Active Directory Group Policy Management but you must be conscious and understand it very well while playing with this feature. Please note that Group Policy Loopback Processing is only supported in Active Directory Environment. There may be some case where you may need to apply a User Based Policy on Computers OU or a Computer based policy on Users OU. In this kind of scenario, you can use Group Policy Loopback Processing to achieve your goals. 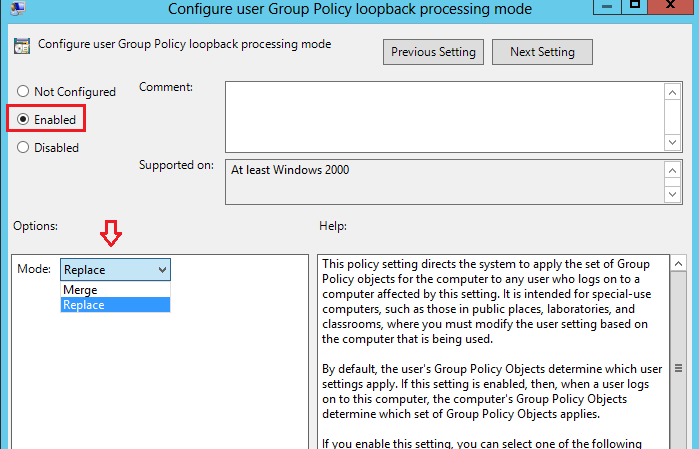 How to enable Group Policy Loopback Processing for a GPO? Steps: Open Group Policy Management Console (gpmc.msc) > Locate the GPO on which you want to enable “Group Policy Loopback Processing” > Right Click on the GPO and Select Edit > Navigate to Computer Configuration\Policies\Administrative Templates\System\Group Policy > Select Configure User Group Policy Loopback Processing Mode and Open it. Select Enable > Now Choose the options as per your requirement “Merge” or “Replace” > Click OK. Note: if you are not sure choosing replace mode, you may go ahead with Merge option. Make sure you understand the risk before applying these settings to any production GPO. Understanding Merge and Replace Modes in Group Policy Loopback Processing. In this mode, when the user logon process initiated, the user's list of GPO is gathered by using the function GetGPOList. The GetGPOList function is then processed by using the computer's location based OUs in AD. In this mode, the user's list of GPOs is not gathered. Only the list of GPOs based on the computer object is used. There are some good stuffs related to this concept written well on MS TechNet. You may refer the below TechNet article for more.